I debated where to put this information... for the technology of satellite imagry being able to show the ocean floor images near Japan, I will try this section. 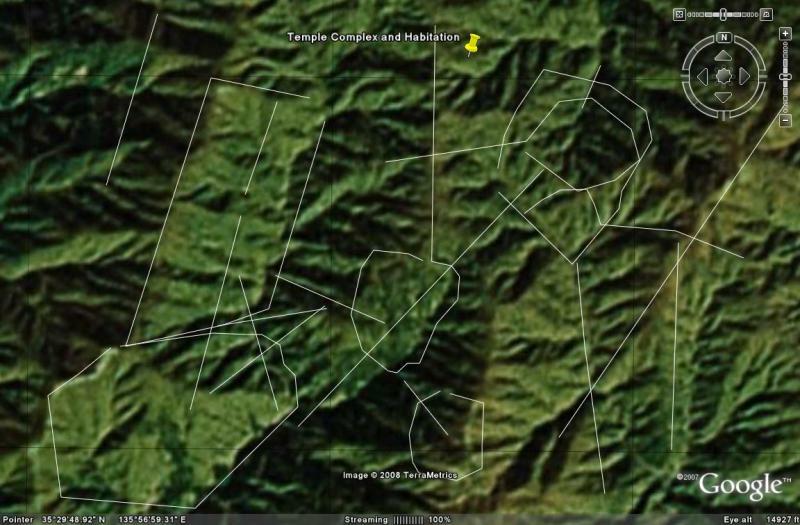 With the assumed premise that Google Earth, and Terrametrics are showing what their satellite images in fact display, then I believe I have something important to share with the readers of this website. While researching Google Earth software with its satellite imagry, I have come across amazing examples of human habitats across various specific locations in both the Atlantic and Pacific. What is more amazing is that these structures, and roads or stellar alignments, are still visible and discernible probably because of the radar scanning which composed the image. My first example is a Northern-full Pacific view, with general habitat lines I added, showing Japan on the left, and California on the right, with human evidence-areas in between. I am not theorizing here, I am totally confident these are human habitats, due to their rectangular features which they display, or circular temple areas, and star cluster arrangements. Mt. 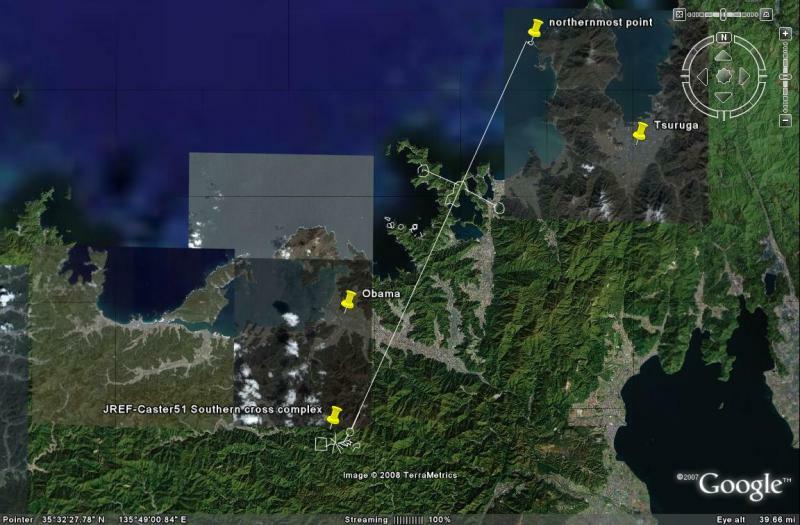 Fuji area, and southeast, underwater, shows what I believe to be a massive temple complex. For the previous scientists, divers, and authors who believe they found a temple complex underwater, close to Japan, let me add my name to the list confirming their discoveries. West and Northwest of Mt. Fuji, from the West coast to 200 miles into the ocean, from Yokohama to Choshi to Sendai, is a mega complex of human habitation evidence: roads, temples, rectangular structures, stellar alignment "star cluster" displays. 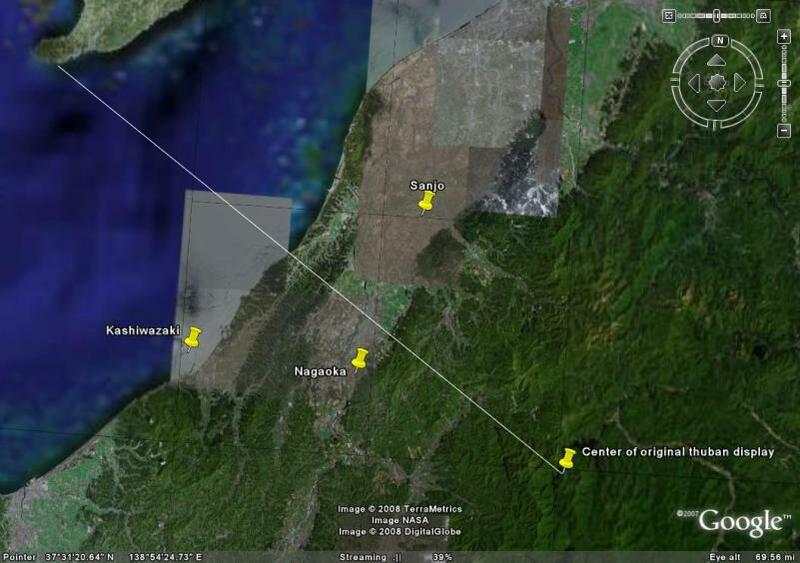 Second view, coastal areas, Yokohama to Sendai, with underwater temple complex, with lines. Third, Yokohama to Sendai, with underwater temple complex, without lines. Fourth view, closeup of underwater temple complex, with lines. Complex dimensions appear to be 200 miles West to East, and 200 miles North to South, all underwater. Finally, same closeup of underwater temple complex, without lines. Yep, you do get some annoying pop ups! Thanks for the heads-up. Cool ideas. They say there is an underground pyramid in a lake close to my house. I am going to look it up. Very interesting! There's a awesome small brewery there too. Tyranena! 1. Actual visual satellite imagry. 2. Radar imagry of the ocean floors. 5. Infrared images, which I have heard about, but have not seen. 6. Side scanning radar images... wherein the urban legend has it that the US military has scanned the entire Egyptian desert and found hundreds of whole cities under the sand, but frankly can't do anything about it. 7. ...and I suspect a seventh...Physically replaced imagry where whole sections show an unrealistic view of the underwater. For example, San Francisco Bay is shown in Google Earth as a pristine south Pacific blue, with underlying snow white sand. In fact, it is an algae green and muddy brown. I accept all of this for security reasons. Most important, is the underlying, undeniable fact: Satellite imagry can see underwater. I say this because I am completely at the mercy of whoever is providing these underwater scenes. If what we are seeing is correct, then the result is REMARKABLE, that even in the darkest, visually opaque-seeming satellite image, I seem to be able to look underwater all over the world. In fact, I suspect the water's surface, if it is not with heavy waves, actually works like a prism, projecting the bottom image on the surface. PS... look at the North Pole, and I am stupified at what I SEEM to be seeing, human habitat indicators less than 100 miles from what we call the explicit North Pole. More on this later!!! Do you think these could have anything to do with USO's? What is your opinion on these findings? I don't understand how you interpreted the data. 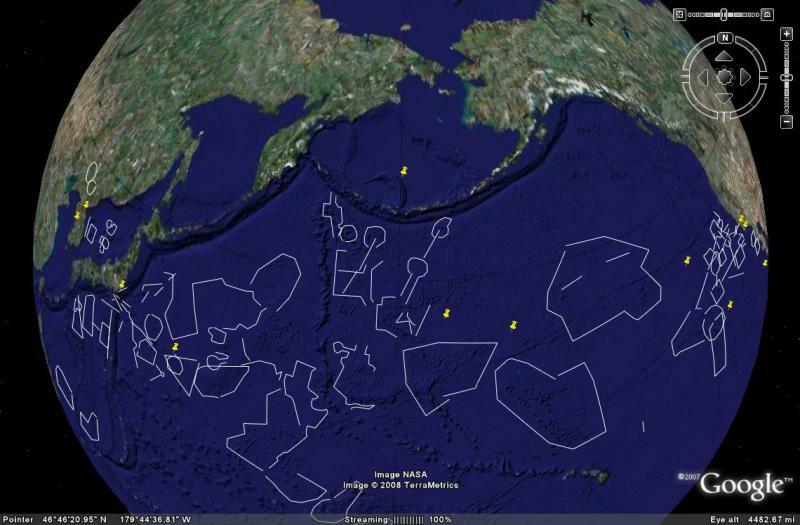 It seems like arbitrarily drawn lines and outlines of fault lines and other rugged terrain under the ocean. What reasoning do you have behind what regions you outlined and others you did not? I'm not necessarily denying your claims, I just see a lack of evidence to support your findings. Valid question. Extremely valid question which I too am wrestling with. I am at a disadvantage when I look at my high definition screen, under low peripheral lighting, and try to capture via enhanced Google Earth software software all the nuances of a graphic, then transfer it into a lower resolution format for viewing on any website. Some people can see the subtleties, others, obviously cannot. Show me a fault line with a straight line. Anywhere in the world. Show me nature with a rectangle or square. "Second view, coastal areas, Yokohama to Sendai, with underwater temple complex, with lines." And it is shown in two aspects. The first one is a severe 22 or 23 degrees, indicating a most probable extremely early date. I am strictly an amateur historian here, closest to a tourist, but a sharp and skilled astronomer could give a date to this angle, due to the precession of the world. What I describe as the Thuban angle was a processional way, the cosmic reflection of the Milky Way, as it rose in the sky each evening, into a North South alignment. The center of the celestial universe changes over the millenia. The ancient heavens rotated around a star in the "little Dipper" called Thuban. Today, the general rotating point is near Polaris. These alignments, in the ocean off Japan and in the Valley of Mexico, containing the long "processional way", and the globe at the top representing the moon, and the globe in the middle representing the sun, they are exactly the same, EXCEPT for the angle of declination. That declination can give you the rough date when it was made!!! It is a clock, and milennia-calendar to the trained astronomer. I challenge both you and me... you pick one of my encircled points, and let's surgically slice and dice it, and let me show you the rectangular walls, and the Thuban processional ways, and the star cluster alignments pointing to neighboring temples. I am writing these things to present to the next generation, and their generation, to decipher. I don't understand it! Stay skeptical! Keep asking these great questions. I am often amazed, that just as I am being asked certain questions, amazing revelations fall into my lap. I have been scouring Japan for geoglyphs and temple structures, both onshore and offshore, and I have come across an unmistakable temple complex in Northern Japan, which seems to be overgrown with jungle or vegetation or something. Now, this one is tough... can you make out the 18 degree angle, the Thuban angle in this image? Can you make out the almost identical line imprint, with circular temple structures intersecting the same line? Would you believe this temple area is one mile long, and one mile wide, and I am guessing it has completely disappeared "in the woods". For this reason, I will be alerting the Japanese antiquities authorities of my discoveries, especially the location of this temple structure. I will be referring to it as the "JREF complex". PS... the culture that made this one mile-long-processional way, is most probably the same culture which constructed some of the identical underwater Thuban alignment structures off the Japanese coast, and probably the middle of the Pacific. So if one digs down into the central locations of this onshore site, one could find out the origins of many of the underwater sites. But no, it is not easy to see. UFOs, I could believe is scientifically possible, but in the form and size of bacteria...flying around in water-borne comets or asteroids. I suppose it is possible. I am taking a 30 second breather here, from underwater images, to onshore ancient geoglyphs and temple structures in Northern Japan. I am specifically targeting an area 34 miles East of Kashiwazaki, 22 miles south east of Nagaoka, in what appears to be either Niigata or Fukushima Prefecture. Possibly some reader could help me on this. Anyways, it is not everyday that I find an ancient city under the "jungle" growth in a mountainous area. To say that I have found a single city is in fact, just 1% of the true story. I suspect I am missing 99% of the picture, when I show you the ancient city I found, EXACTLY like a Machu Pichu set of dense, dense habitats. This include residences, and temple structures. I am referring to it as the "JREF complex". Who in the Japanese government, or what Universities in the Niigata or Fukushima Prefectures would be interested in this archaeological find? I was trying to find that spot on google earth...could you get me "directions". Sorry I am not the best map person. I found Tokamachi which is near where my in-laws live (Tsunan doesn't show up) and it looks to be a bit north and west. Could you verify that I am least in the right area! I just watched a tv program about the satellites being able to find many ancient cities under the deserts (which you mentioned) along with ancient rivers and lake beds. What I find interesting is that when you look at old, ancient texts that we thought were simply stories or parables, because there was no evidence of the cities mentioned or lakes etc, we can now see that there is some truth to them. It's really an exciting time! Goldie...first of all, Google Maps gives you the opportunity to raise and lower the altitude of the perspective, meaning you could get the entire nation of Japan if you wanted to raise the altitude indicator on the left hand side of the map image. But lets do it another way. Let's start with the grand view, showing Mt. Fuji in the South, with Kashawazaki in the North. Note, I may have positioned Nagaoki in the location where Sanjo is actually. So I repositioned Nagaoki closer to the South. Next, draw a line from the southernmost part of the island off Kashawazaki, and crossover to the main island at the point where the grey image meets the color image, explicitly on the coastal triangulated point. (two satellite images, one grey, one colored) Extend it past these two intersecting points for a total of 65.47 miles to the southeast, along this transit line. In Egyptian, I can almost guarantee this means... the "pan", the "origin" of the spirit "Chee". Or in pseudo science "God-Land of the rising sun". We have a "Shippan" in Stamford, and a Chipenengo (I think that is the way you spell it) in central America, both are on the East coast, facing the rising sun. I believe it actually goes back to the Babylonians, but that is my opinion. Note: Cap A in English is the God, and lower case a, the cartouche is the King. God and King. First letter of the English alphabet. Note: There are 100,000 locations yet to be found in Japan alone, onshore and offshore, thanks to the Google Earth imagery. Let me give you my secrets here. This first view is of the Northernmost point of the Japanese mainland, North of Aomori in the Tsugaru Strait, South of Hokkaido-Sapporo. 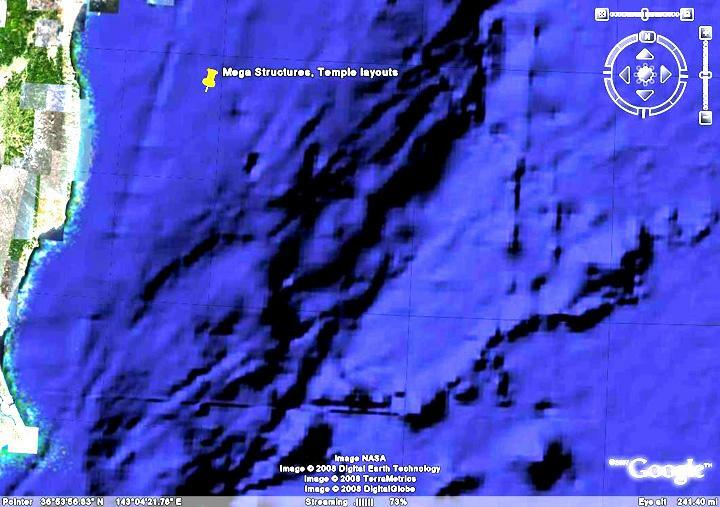 I am particularly interested in the offshore view, the underwater temple areas near Cape Erimo. In the extreme ancient times, I am guessing at 6,000+ years ago, they were an astronomical society in love with the Milky Way, the "celestial tree", which rose up every evening pointing to the center of the celestial heavens, probably near Thuban. These astronomical societies seemed to be circular in nature, with a temple complex in the middle, and had these laser-beam roads or walls or boundaries to the next cicular temple community. I see these cicular boundary marks all over Japan, on land, and in the ocean. Of course, where there is heavy agricultural tilling of the soil, you see nothing. And where there is deliberate obscuring of ocean bottom features, or fuzzied out images, as in some areas of this view, you see nothing. 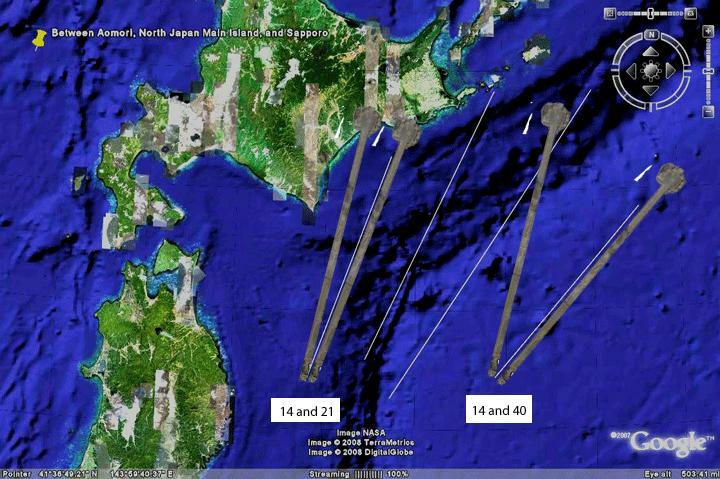 But the net result is fantastic anyways, for so much of Japan and the oceans surrounding it. Counter-clockwise "March of the Thuban alignments": the far right I am estimating is 6,000+ BC, all appear to be "pre flood". The world's oldest time calendar? For example, in this underwater scene, 500 miles wide, 300 miles high, I am suggesting that we are looking at four "Thuban" alignments among many star cluster temples. The far right alignment, on the far side of the ocean fault (with the circles), shows an angle of declination of I am guessing, 25 degrees. There may even be one further to its right. These are the oldest Thuban alignments, and it has to be very, very ancient, pre flood most probably. As a guess, let me just throw an age-number of 6,000+ BC. To the left of the far right "Thuban", are alignments rotating counter clockwise. To the left of the fault line, is a more moderate Thuban angle, an estimated 18 degrees declination. Again, these alignments have to be pre-flood (and there were probably many floods and deluges and catastrophes in 6,000+ years). Again, I am tabling these pseudo-guesswork theories, for real scientists to analyze. This is way over my head on the science, astronomical, archaeological, and math sides. On both land and sea floor, I follow these ancient star cluster lines, "Thuban alignment" lines, "circular boundary" lines, and follow all the neighboring lines to their convergence points. These alignments point out the temple and altar structure lines. Remarkably, many of the pointers come to locations not known locally, or the convergence point shows no modern indicators at all. Possibly the temple structure material was used in more modern building purposes. However, typically underneath these star cluster convergence points are underground temple and tomb areas, where artifacts will be found. Usually these mean tombs, tunnels, pottery, jewelry and of course, long-decayed bodies of ancestors. Again, I am seeing hundreds of locations on land, and about 200 locations off shore. That means there are thousands (or tens of thousands) that I haven't discovered yet, in Japan alone, on both land and in the ocean. 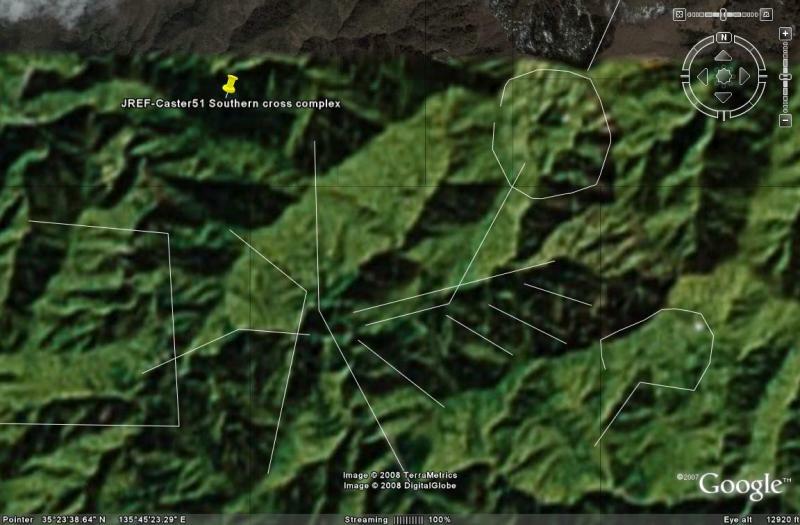 Strange, and we have an underwater pyramid, and many other earthen ones as well. I was reading about Mexico and they found pottery with symbols that are Egyptian. How did ancient Egyptians symbology end up in Mexico. I think the ancients were far more advanced that we think. I read that Thor Heyerdahl prooved that reed boats could have crossed the oceans, so it's not so unthinkable that there was a transfer of culture and knowledge. Why do pyramids all seem to appear around the same time? Is it really just coincidence? I just don't think so. This is a treasure hunting training exercise for finding locations in Japan or anywhere.. I went to your area for treasure locations and I found them. You are surrounded by interesting areas, mostly built up though. Not Kekoskee!! Try the Kekoskee swamp area. Loaded with altars and geoglyphs, above water and underwater. If you know anyone with a metal detector, I am pinpointing altar locations you could dig. Let me know if you need more locations. Kekoskee Wisconsin Geoglyphs...turn off the lights, watch this for five minutes. This swamp area is exploding in geoglyphs underwater and on land. I make this offer to the next 10 people reading this thread. Give me a location in Japan, or anywhere, and I will do my best to direct you to the nearest ancient altar or temple "star cluster, convergence point", which usually means artifacts will be buried under that explicit point. There are I think, 10,000 more locations waiting to be found in Japan alone, and possibly you could be the one to go to that location and find artifacts for academic study. Old Shippun, the location our one of our contributors, was named by the fact that it sits slightly to the West of the coastline of Lake Michigan, and it faces the "Rising Sun", the "origin-pan", of the spirit "Chee-Shi". Likewise, in Stamford, Connecticut, we have a "Shippan", which sits on the coast of Long Island Sound, and is the first to face the "Rising Sun". Likewise in Central America, on the East coast, there is a place called Chippengo, which I believe means... "Rising Sun King", ("engo" is plausibly the In-Ka, King). I dont know at all.. Yes, you are absolutely right! Thuban calendaring! Yes, absolutely correct. I bet there are a thousand or 10,000 authors before me. If you checked with the local people of Kashiwazaki, they probably ALL know that their countryside in the mountains is littered with hundreds of temple structures and ancient, ancient habitats. Keep digging. Keep finding those pre-published accounts. In America, we throw those old legends away, and old published works too. I am rehashing in the United States, what was discussed repeatedly over the last 250 years from the Dutch, English, even Amerindian legends. To add to your amazing, amazing graphics, and the Thuban alignment structures I found in the ocean off Hokkaido, I compared the Thuban alignment of Teotihuacan with the 4 alignments off Japan's North coast. 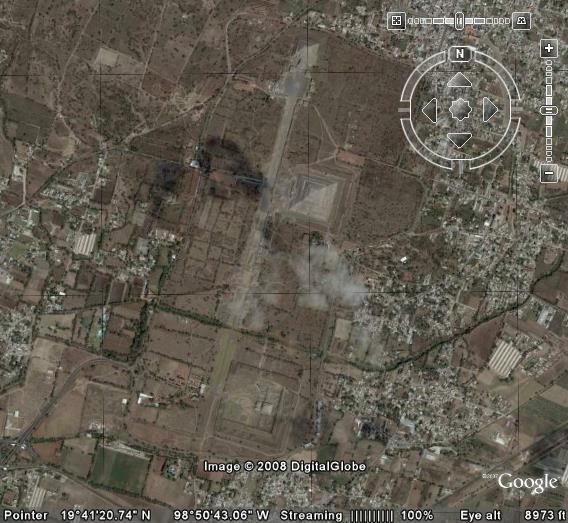 The left angle shows the 14 degrees of Teotihuacan compared with a 21 or so degree angle of the left most image. Teotihuacan is generally dated at 400 AD. So, if I make the assumption that the Japan latitude didn't matter when compared to the Valley of Mexico, and they were aiming at the same Thuban North celestial pole, then the left most white line off Hokkaido was done 7 degrees earlier than Teotihuacan. Traditionally, though, temple structures are built over the top of previous structures, so a 400 AD date is the most modern improvements of earlier structures. This means, mathematically, we can only date that left white line with the precessional spin of the cosmos, 25000 years, with the formula: (7/360 x 25000 years). A rough guesstimate is that the left white line cannot be more modern than 100 BC or so (486 years earlier), but it can be much earlier. The right-most line, though, with the 14 degree and 40 degree comparison of Thuban alignments, means a 26 degrees earlier time frame for construction, and that would mean... (26/360 x 25000), or 1805 years earlier than Teotihuacan (100 BC). Therefore, the rough guesstimate is that the right-most white line cannot be more modern than ~ 1900 BC, but it can be much earlier. Down East of Choshi, about 150 miles off the coast into the water, and it shows an entire island straddling the fault line. We are all onto something, that probably was theorized many hundreds or thousands of times, before they had the capability of Google Earth. We are onto something huge, I believe, but mostly understanding the wonderful work that came before us, by countless others. Another Machu Picchu style, mountainous vegetation-overgrown temple complex, this one North of Kyoto, 10 miles Southwest of Tsuruga, 10 miles East of Obama. 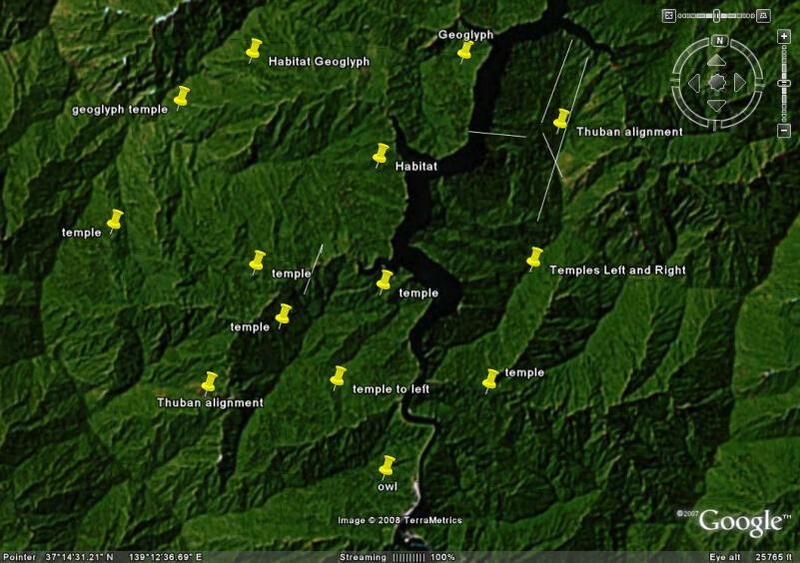 Note: If one could find artifacts at these mountain temple complexes, and correctly carbon date the artifacts, then one could compare the Thuban angles of declination of the Temple sites, against the undersea-Hokkaido Thuban angles, to correctly date the undersea habitats. Caster... great graphics again....and I found and confirmed what the author was talking about in at least one of them, although I do not understand Japanese. Possibly you could alert him to this discussion and usage of his graphic? Top of cross, in water.... Note, the only disagreement I have with the graphics author is that the northernmost point seems to point offshore slightly, and the same alignment line continues up to temple locations up North, across the Bay. Note, the Thuban alignment continues southward towards the Kyoto region. So this indicates that this cross structure was built before the final "flood event" which drove the people off what is now the Pacific floor. 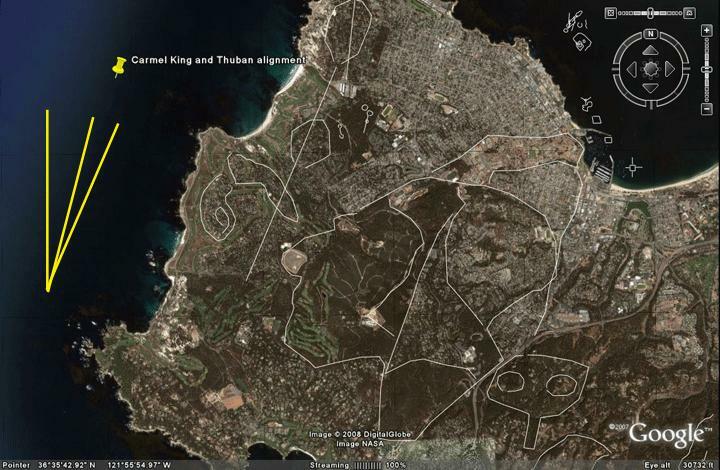 Google Map of "Thuban cross center"
I have found a "Carmel King" geoglyph on the California coast, looking West. To this position, I believe he is looking towards his homeland, which is most probably Asia. Note: I added the Yellow lines on the left side to show "North" of today, followed to its right with the 14 degree Thuban angle of Teotihuacan in the Valley of Mexico, indicating a date no more modern than 400 AD. The third yellow line on the right is the Thuban angle of 23.3 degrees of the Carmel King geoglyph, indicating an age 625 years before Teotihuacan. (9 degrees divided by 360, times 25,000 years, of full precessional spin). So this 23.3 Thuban angle of the Carmel King is at least 225 BC, and probably much older. Also note, the entire area, onshore and offshore shows major human habitation indicators. The surprise is that the concentrated developments in and around Carmel did not obscure the ancient figures that much, and are still visible. In fact, it appears that modern home developments wrapped around many of the large scale geoglyphs, preserving them without realizing they still exist.